Not able to go out with your loved one for Valentine’s Day this year? No problem! 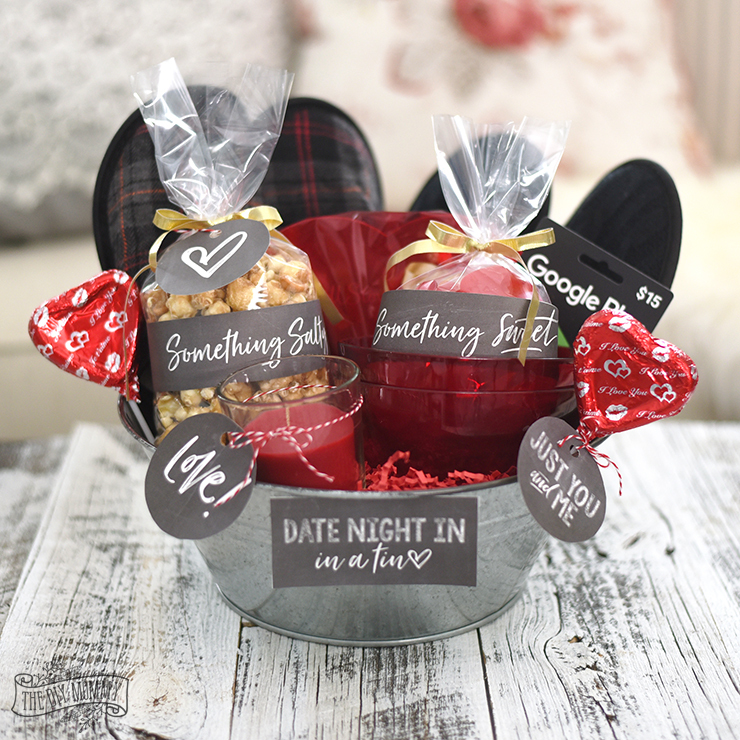 Make this V-Day “Date Night In” In a Tin and enjoy a cozy date for two at home, slippers and all! I love turning a collection of ordinary things into a beautiful, meaningful gift by making a gift basket. This Valentine’s Day inspired gift basket was made with items from a dollar store, and I think it turned out so cute! I can’t wait to give it to my Mr. so we can enjoy a cozy evening IN this Valentine’s Day. 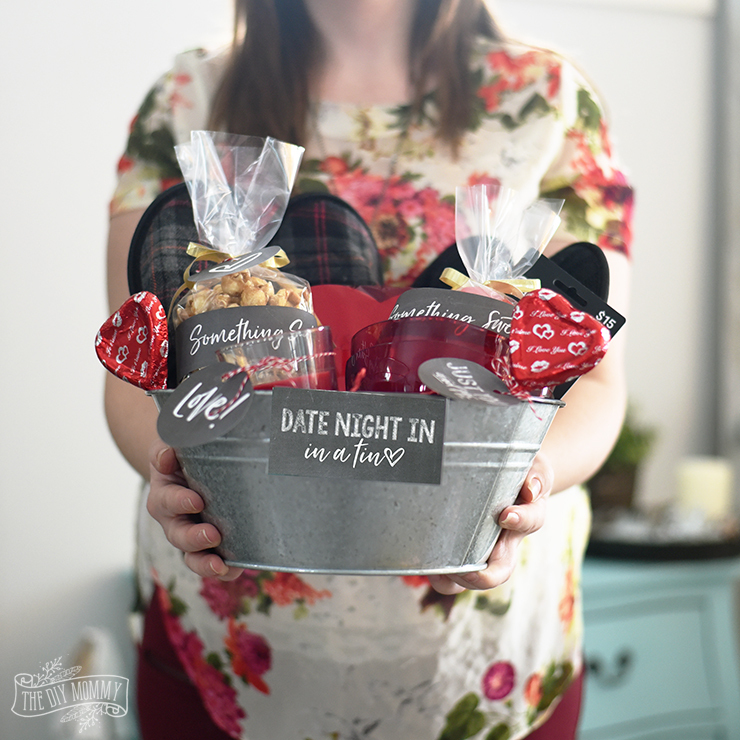 Let me show you how I made this “Date Night IN” in a Tin, and make sure to scroll down to the bottom of this post to see tons more beautiful DIY ideas from my Canadian blogging friends for Valentine’s Day! In this gift basket, I’ve included lots of things I thought my hubby and I would enjoy on Valentine’s evening. Like most of my gift baskets, I’ve compiled them all into my signature galvanized bucket for a rustic look. There are slippers to keep our feet warm, a candle for a warm glow, some treats and heart-shaped bowls for a snack, and a gift card for us to order a movie online from home. I spent about $45 on this gift basket, so I think that’s a great deal for a romantic date night IN! The trick to a pretty looking gift basket? Decide on a colour scheme and stick to it. For this gift basket, I choose to use black, red and gold. I even found some slippers at the dollar store in my colours! 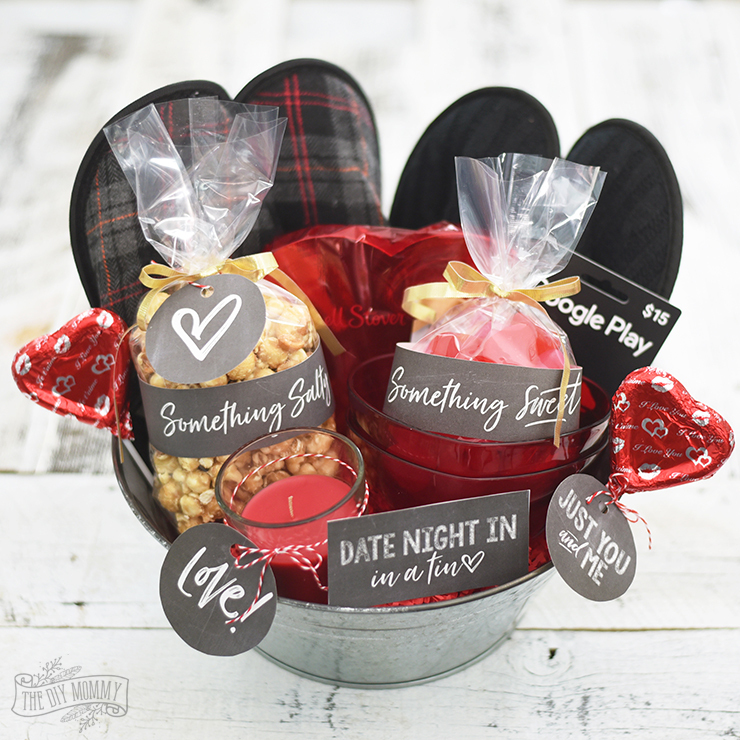 Ready to make your own DATE NIGHT IN in a Tin for your special someone this Valentine’s Day? Watch this quick video to see how! I’m thrilled to be a part of such a talented group of DIY bloggers. 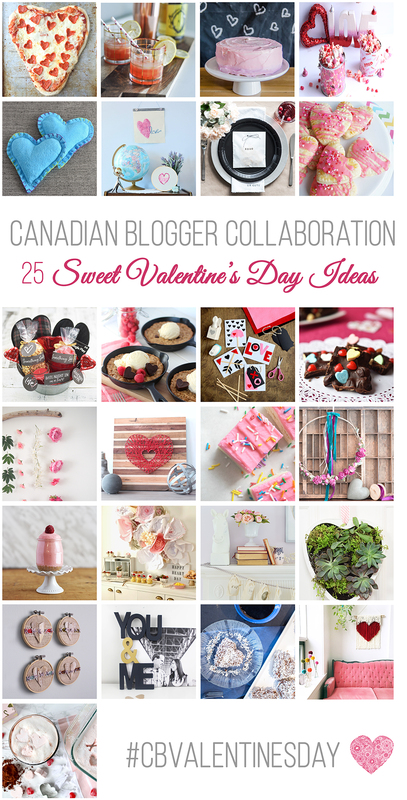 Every day this week, a group of us are sharing more Valentine’s Day DIY ideas. Make sure to visit all of these posts using the schedule below! Awww such a great date night in basket! I would totally do this as a gift. What a lovely, simple idea! Aww perfect! You’ve included everything you need, I love it! Such a great idea, Christina! We tend to stay home on Valentine’s Day, and I love the idea of getting cozy and watching a movie. It’s so much better than getting dressed up and braving the cold! This is such a great idea Christina! With 3 kids at home it’s hard to get out for a night, so the idea of date night in is great! 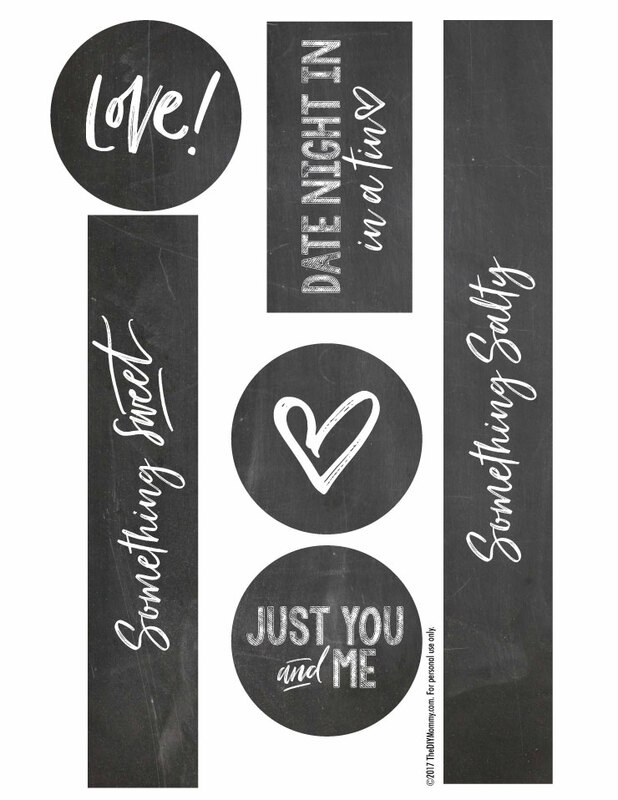 Free printables are the some of the best things about blogging. Thank you for these! The gift looks amazing! Thank you, Alex! We are glad you enjoyed them!!! This is so cute. I love the collection you’ve put together. I hope you have time to enjoy! Oh!!! This is so FUN!!!! I may just make one for my man! Thanks soooo much for the inspiration! You are ever so welcome!! Another perfect gift basket. Love the treats, and the movie idea, and the slippers, and well the whole thing. Great gift idea. Making the most out of a night in, what a thoughtful gift idea. I really need to up my gift giving game this year! Date night in is great if you want to spend some alone time with your partner, preparing valentine basket like this is really a good idea to amaze your partner with your creativity. Thanks for sharing!